Your business is on the field of one of the most competitive games of all: organic search rankings. If you play by the rules, you have a chance of making your website visible to searchers and winning site visitors. If you don’t follow the rules, you have no chance of scoring those goals if there’s a referee on the field. Search engines play the role of referee in the search engine optimization game. For business owners, this means that ethical SEO conduct can pay off. Google has a manual actions team whose job is to help keep the search results clean. They back up the algorithms (which do most of the work filtering out webspam) and review individual cases by hand. These people have the power to blow a whistle to stop misbehavior and even to bench a player who refuses to play by the rules. I like to picture them in black and white striped shirts (though I’m sure jeans and t-shirts would be closer to the truth). While referees can be very unpopular, their words carry a lot of weight. This week Google published a report titled “How we fought webspam in 2015” chronicling what they discovered and accomplished last year. Impressively, the manual actions team sent more than 4.3 million messages to webmasters last year. That means webmasters were notified personally not only of a yellow flag being thrown, but also about what caused the penalty action. 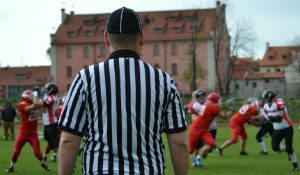 Google referees may not be popular, but they help keep sites playing by the rules of SEO conduct. From a searcher’s perspective, all of this refereeing is fantastic news. It means that if I search for “referee clothing,” I will actually see striped shirts and not spammy, unwanted junk. Touchdown! From a business’s perspective, however, Google penalties can be livelihood-threatening realities. Since the introduction of the Panda Update in 2011 and the subsequent waves of algorithmic and manual action Google penalties, we’ve seen a rise in SEO services clients requiring penalty assessments and removals. This latest report from Google is important for online businesses to be aware of because it points to trends in webspam and identifies red-flag digital marketing tactics to avoid. To partner with a top-tier technical SEO agency and grow your website’s revenue-driving potential, fill out our request form or call us today. Below I’ll explain more about how webmasters can deal with Google penalty situations. But first, here is the state of webspam, according to Google’s report. It bears repeating that Google’s manual actions team sent more than 4.3 million messages to webmasters last year. Many “penalties” occur algorithmically and can blindside webmasters with a sudden, unexplained loss of search traffic to their sites. You’ve got to appreciate the fact that the search engine takes the time to notify this many people directly to communicate that a problem and/or penalty has occurred. SEO Tip: You’ll find any messages sent by the manual actions team if you look in your Google Search Console account messages. So if you haven’t set up Google Search Console yet, do it now! Google’s manual actions team reports that “sites with thin, low quality content” are the second most commonly increasing form of webspam. Businesses should know that we’ve been living in the age of Google’s Panda algorithm update for several years now. What is Google Panda? Panda eats low-quality content for lunch. And Google told us earlier this year that Panda is now part of its core ranking algorithm. A Google manual action notice is usually terrible news for business owners. A penalized site drops in the search engine rankings, losing untold revenue from website traffic that’s no longer coming from search. If this happens, site owners may not understand how to recover. Sometimes the issues are straightforward and, after a bit of housecleaning, the site owner can submit a Reconsideration Request to Google and be restored to good standing. But can a notification by the manual actions team be GOOD NEWS? It can be if it alerts you to a problem. What problem caused the manual action? What will it mean for my site (i.e., in terms of ranking and revenue)? How can I fix the problem as fast as possible? If your website is hacked, Google’s manual actions team may be the first to notice it. Google’s webspam fighters have gotten pretty good at identifying when a site is the victim of hacking, rather than purposely trying to spam through deceptive SEO conduct. And that’s great news for webmasters. Juan Felipe Rincon, a lead of Google’s Webmaster Outreach team, spoke on manual actions at SMX West. He explained: “Content that wasn’t put there by the legitimate site owner and website hacks account for 45 percent of manual actions.” Forty-five percent of 4.3 million manual action notices represents a HUGE number of sites victimized by hacked content. SEO tip: If your site has been hacked and you get the news directly from Google, be thankful. It’s a diagnosis you need to hear so you can work on curing the problem. For all webmasters, Google’s recommended preventative measures can help you protect your content and keep your site safe from hackers. Sites scraping content from other sites to fill their own pages is apparently happening more and more. If you have received this type of Google manual action, here’s SEO advice for what you can do about thin content. There’s light on the horizon of this whole Google penalties/manual actions world. A lot of light, actually, especially for people practicing SEO ethics. Many webmasters have cleaned up spam on their sites. There were 33 percent more sites last year that went through Google’s reconsideration process successfully, compared to the previous year. Google’s webspam team acted on 65 percent of the more than 400,000 spam reports that users submitted globally last year, and considered 80 percent of those to be spam. Spam doesn’t pay. A business hurts itself if it stoops to scraping or other manipulative tactics to influence the search results. The web is a much fairer playing field for ethical SEOs and site owners who focus on creating quality sites with high-value content. Have you seen a drop in traffic to your website over the last several years? If you have been wondering why, know that if it’s due to a penalty, you’re not alone. Here’s the story of one client we helped recover from the depressed traffic of a penalty. A niche ecommerce company named Groomsmen.com suffered Penguin penalties that all but wiped out their organic traffic from Google. Trying to recover on their own, they cleaned up their SEO conduct as best as they could and ended their paid links program. However, for two years their rankings did not improve. On a friend’s recommendation, they came to BCI for help. We gave them a hyper-focused, three-month SEO project that combined our Penalty Assessment and Link Pruning services. During the six months following our project period end date, the site’s organic traffic from Google grew five-fold compared to the previous year, yielding a 513 percent increase in ecommerce revenue from search. Competition is fierce among organic search results. But compromising on ethics is a sure road to disaster! Want an experienced, ethical SEO agency to grow your website’s revenue-driving potential? Reach out using our form or call us today. I worked with websites that had manual penalties but ranked on the first page anyway. This is the message they had on the dashboard “… Therefore, when determining your site’s ranking, we will demote links to your site as a factor in our calculations. This manual spam action has been applied to your domain.” I didn’t submit reconsolidation request and websites still rank on the first page after 6 months! Subhasish: You bring up cloaking, which is another red flag issue. We have a free SEO Cloaking Checker tool if you want to try it out: https://www.bruceclay.com/blog/free-seo-cloaking-checker-tool/. Thank you for detailed information on Google web spam. Very informative post. You are right, ethical SEO practice is the best way. Thin content, clocking, link building in unnatural way really harmful for any business. I am really happy to read this post. 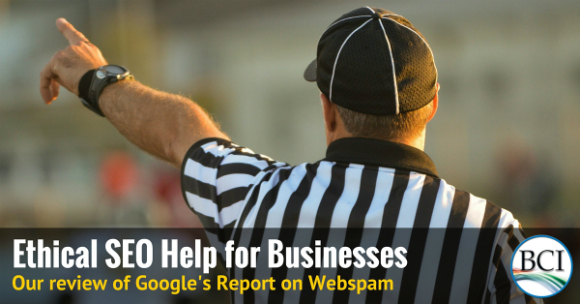 Thanks for the valuable input about Google’s report on seo & webspam. I will follow these tips. I always suggest everyone who are up to start SEO for their business to use ethical SEO to get long term benefits! This post is really informative and shareworthy! Good Job! Hi, one of my site got suspended by the hosting. It was hosting’s provider billing error, I have paid but their system did not detected it and suspended my hosting. Now the site has back online but it is nowhere from Google top 10 SERP. Do I need to do some ethical SEO or just wait for my site to come back to top position? Thanks. Etalon SEO: That’s nasty business, and a perfect example of what Google’s report said they are running into a lot. Thanks for sharing the nitty gritty details here. Hackers are becoming a big pain for SEO Agencies. Two weeks ago one of our clients saw a huge drop in rankings. After some research we have found sneaky redirect codes in WP header.php where it was checking for google bot and showing different page. It also was adding tonns of new pages that made the website look like a doorway. Fixed that, waiting for positions to come back. Harry: Thanks, glad it helped! To get good google ranking you must make ethical SEO. Other wise site might be banned by google panda. Thanks For nice article. Sunil PNR: Please reread the article and save yourself (and/or your clients) a world of pain. Black hat methods can burn a domain to the ground. Thanks for this informative post. I want to know more about blackhats methods. How actually blackhats works. Best practice of blackhat SEO where google dont penalize. Quite interesting post about Ethical SEO. We have seen it take from 1 day to a week for Google to process a review, but each situation is different. Our developer reminded me that we should remember that Google’s success is based on the quality of their results. Google is taking extra strict precautions to not steer users to a site that may be harmful to them — this is a 0-tolerance kind of situation; not like the spam that sites try to do to help SEO. How long has it been since you submitted your request? I hope it won’t be long for you now!